At the end of March 2016, my portfolio stood at $113,788.55 across all my accounts combined. Comparing to my portfolio balance of $104,962.94 at the end of February 2016, this represents an increase of $8,825.61 for the month of March which represents a 8.41% increase for the month. New investments accounted for $1,500.00 thus giving a net increase of $7,325.61 that represents a 6.98% increase for the month. I continued my weekly sharebuilder purchases in March. I did not have any other purchases. Here is a graph showing the growth of my portfolio since 2009. Disclosure: Long on all stocks mentioned above. This entry was posted in Portfolio and tagged portfolio, sharebuilder. Bookmark the permalink. 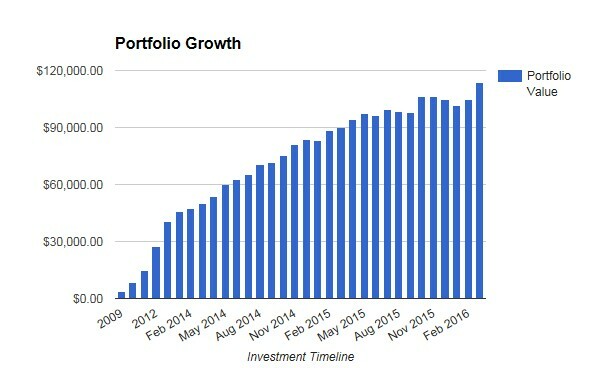 Nice portfolio growth. March was a fine month for market increases. Your portfolio value since 2009 looks fantastic. Thanks IH. Though the portfolio value doesn’t directly correspond to dividends, they do play a role. The market keeps the prices and dividends in tandem over the long run. So it is nice to look at the overall numbers once in a while. As you know already, I like your weekly buys. It keeps you very consistent with your investing and on track towards building out your portfolio over time in all market conditions. You are probably the best example of not being a market timer yet still putting up great dividend income results. Like you, I do not time the markets but instead force myself to make at least one buy each month, in all market conditions. Keep that portfolio growing! Thanks DivHut. The market has definitely been volatile for the past few months and I am trying to keep the investments going irrespective of the market conditions. Just trying to pick the attractive ones then and there. Great increase for the month of March — nearly 7%. Keep up the good work and all the best! That’s a great result this month! I like your consistent purchases and watching the numbers grow higher. Thanks DL. It does seem nice to see the numbers go higher.